A concerned parent emailed recently asking for advice about websites that promised "unlimited PSP downloads." Did they really offer "unlimited" downloads? Were they legit? He'd just bought his son a PSP Go, and since the Go lacks a physical disc drive, was presumably looking for alternatives to Sony's online software store. I had a look for myself. The sites, allpspgames.com and sonypspgocenter.com, purport to dish up all-you-can-eat gaming for a one-time fee that ranges from $35 to $45. They offer promises like "download as much as you want at no extra cost," that "all memberships are backed up with a 1 week money back guarantee," that they're not a "pay-per-download service," and that "all memberships include easy transferring software." Read a bit closer, however, and you find shadier syntax, like "Bank Statement...a discreet charge on your Credit Card," and "Your membership gives you access to thousands [sic] PSP files content." A discreet charge on my credit card? Why the need for secrecy? And "files content"? What's that? What happened to those "thousands of always updating games"? At this point, I'm pretty sure it's a scam, or at best, highly illegal (slapping a picture of a girl licking a PSP on your homepage doesn't exactly inspire confidence) but I want to make sure. What's on the other side of the pay wall? Do these sites actually host "300,000 available downloads," including "Games, Music, Movies, TV Show, Animation, Software and much more"? If so, why hasn't Sony shut them down? After all, the only legal way to pull down commercial PSP games is through Sony's PlayStation Store, either indirectly with a PlayStation 3, or directly via a PSP or PSP Go. A quick search engine check confirms suspicions, with millions of hits and thousands of "Is this site a scam?" inquiries, most on message boards from users rightly skeptical about the obvious "too good to be true" angle. It turns out sites like allpspgames.com and sonypspgocenter.com are simply fronts for file sharing sites that offer illegal content, or I should say "access thereto." They're not the data bank (they host nothing local), they simply hold the door open and usher you through. Not that the door needs holding. The information they link to, which includes file sharing apps like uTorrent and Limewire, is freely available, as well as flatly illegal in almost all cases, the handful of legitimate files (themes, pictures, homebrew games, etc.) on offer notwithstanding. These scams are actually old news. 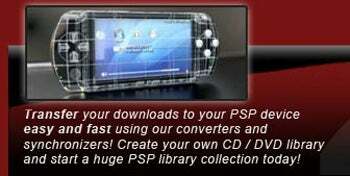 PSP Blender, one of the first to offer "access to millions of files ready to be transferred to your PSP" for a one-time fee, has been at it since 2006. Check out McAfee's writeup on the site and you'll find a list of "credible users" noting the site "may not be what it claims to be." 39 rate it as engaged in "phishing or other scams." The same (or similar) holds true for McAfee's allpspgames.com page. Have a look at PSP Mod, a homebrew enthusiast site for the PSP, and you'll find a list of dozens of PSP scam sites, all pretty much following PSP Blender's highly deceptive model. Long story short, steer clear of this stuff. If you're looking for PSP games, the only online store that sells commercial titles is Sony's. And if you're just after wallpapers or themes or homebrew games, i.e. games designed by amateur designers, most of the legit sites offer them gratis.